Jerusalem - A video released by Hamas militants on Tuesday allegedly shows Hamas members traveling through a tunnel and coming out near Nahal Oz where five soldiers were killed. 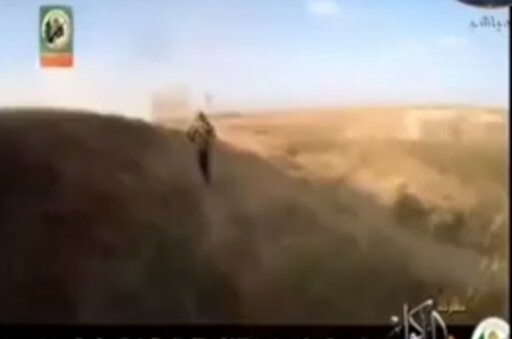 The video shows the militants coming out of the tunnel with a rocket-propelled grenade (RPG) and then approaching an Israeli military. Militants fire on the post, then barge through the gate and fire on a soldier lying on the ground. Exchanges of gunfire between the IDF soldiers and the Palestinians are also shown. The men then leave the post and run back to the tunnel. The Israeli's are currently in a war to destroy all the tunnels. However, this war like the entire war against Hamas is futile in nature. As everyone know Hamas is invincible one cant fight a terrorist organization. So all these war and all the innocent blood shed is unfortunately for naught. We need peace and that will be the only way out of these dangerous wars. “ The Israeli's are currently in a war to destroy all the tunnels. However, this war like the entire war against Hamas is futile in nature. As everyone know Hamas is invincible one cant fight a terrorist organization. So all these war and all the innocent blood shed is unfortunately for naught. We need peace and that will be the only way out of these dangerous wars. To #1. What a genius solution you have! I have one question for you though. How in heavens name are we supposed to make peace with an entity that seeks nothing less then our total distraction??? There is no choice here. They need to be eliminated exactly the same way the Americans dealt with the Taliban and Al Qaida. Nothing more to be said. But Hamas doesn't want peace, they are religiously opposed to "any" compromise. Should we just give up and run? Your a idiot . You can't make peace with people who's only goal is to kill you. Its liberal idiots like you who cause Israel to constantly cease fire and never finish the job. Who took the video? And I imagine that was the end of that tunnel. #1 is actually correct that we need peace. Israel is and has been willing to make peace for the last 66 years. It's the other side (call them what you may) that refuses. Distraction wouldn't be half bad. You meant to say destruction. Duh. And how do you propose to "get peace?" Every successive govt in Israel has tried giving away land, talking, negotiating, while the US and other foreign nations tried mediating for so many years and yet the terrorists keep attacking, so brainiac, what do you know that everyone else has missed?? Napalm is too expensive. Gasoline is fine alone. The carpet bomb all of gaza. Just curious as to how this video happened. it was taken as they came out of the tunnel...on the palestinian side. anyone suppose they have an answer..I also think it would be advisable to avoid videos where these rotzchim kill our soldiers. Who is interested in that? Some common sense needs to be used regarding the enemy..Don't think anyone used it here by supplying vin with it. We are not the propaganda machine for them..............and their reasons to celebrate... Brains people, brains.